Optional wall control for Broan Solo, Duo, HE and Kubix air exchangers. This optional control provides three convenient settings (20, 40, and 60 minute) to help control excess humidity. 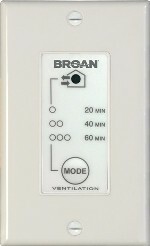 This timer allows the unit to turn on high speed during 20, 40 or 60 minutes to expel rapidly indoor stale air. Within 2 seconds, press once for 20 minutes, twice for 40 minutes or three times for a 60-minute activation. Press another time to deactivate.